Sharks name Joe Thornton captain. A look at the pros and cons. Sharks coach Todd McLellan named Joe Thornton captain today — a minor surprise for Sharks fans. A lot of fans, including myself, expected Dan Boyle to be named the 11th captain in Sharks history. Turns out Boyle will be a permanent alternate captain, with Patrick Marleau and Ryane Clowe alternating the second ‘A’ for home and road games. Probably the immediate reaction from most hockey fans is that we’ve seen Thornton be a captain before — in Boston — and how it failed miserably. Thornton, 31, says he’s much more mature now being a father and having more experience as a person and hockey player. While you can’t deny that, he still is very much the same type of person he’s always been. A laid-back, glass half-full type of guy. With that said, let’s take a look at a few of the pros and cons of his captaincy. He’s positive. Jumbo Joe will never panic; that word is not in his vocabulary. After every game, he’ll give some version of the phrase, “We’ll be fine,” either after a win or a loss. What’s intriguing about this is Boyle is the opposite. Boyle wears his heart on his sleeve, giving the Sharks a nice dynamic in leadership. He’s the face of the franchise. This doesn’t pertain much to play on the ice, I know, but it could be a good marketing tool for the Sharks in reaching out to potential NHL fans. 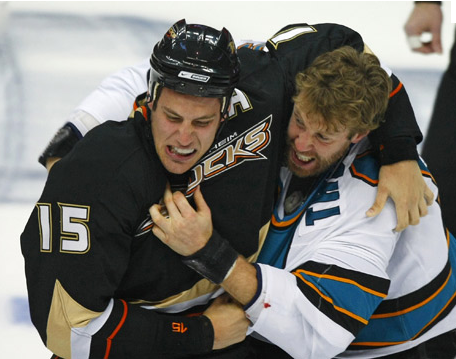 Hockey fan or not, a lot of people know the name “Joe Thornton.” Now they can ID him more easily with the team in San Jose and as a captain. Regular season prowess. In order to win the Stanley Cup, you have to make the playoffs. While the Sharks have claimed the top spot the last two years, Thornton’s point totals have fell to the upper 80’s. Having the captaincy could make him step his game up in the 82-game audition for the playoffs. It’s a contract year. This could change in the first month of the season, with rumors of an extension going on for some time now. But if GM Doug Wilson chooses to let the season play out, it could be even better play from Thornton, who will be looking to cash in. I think the captaincy also puts to rest the trade speculation, but you never know with Wilson. But in all honesty, I see an extension for Thornton by December. He’s positive. Yep, this is exactly the same thing as the “pro” above. Having a captain who is always looking at the bright side of things isn’t always good. Thornton mentioned he likes to keep things light and fun off the ice and serious on it. Sometimes you need someone to step up in the locker room, off the ice, and tell the players what needs to change. When it comes to speeches, I’ve always thought of Joe up in front of the players cracking jokes while trying to convey a serious point. Inconsistent passion. Contrary to how Joe says he is extremely passionate about the game, he fails to bring it all every night. You can find him coasting around the ice on some nights, not really caring, and committing atrocious turnovers from lazy passes. That is not captain material. Bottom line: The jury’s still out on Thornton being captain, but no doubt the majority of NHL fans are laughing at the Sharks right now. I’m very weary of the move and would have preferred Boyle be captain with Joe Pavelski getting an ‘A.’ But I’m not a coach or see the inner-workings of the locker room, so for now it’s just about supporting the decision and cheering for the Sharks. Quite the rough-and-tumble game for the Sharks as they held on to all but eliminate the Calgary Flames from the playoffs, winning 2-1. No Jarome Iginla in the playoffs, no worries. Most impressive was the Sharks ability to withstand and neutralize any sort of Calgary onslaught at the beginning of the game. It wouldn’t have come as a shock to see an early Flames 2-0 lead. Sharks coach Todd McLellan may have been right, before the game, when he said they were well aware the Flames would be desperate. Pardon me for questioning the Sharks psyche. It’s not like I’ve had any reason to. Part of the solution was Evgeni Nabokov. Nabby played great tonight, and it’s slowly becoming realized that he’s getting into a rhythm. Perfect timing. Even more fantastic is the Sharks secondary scoring is hot. Jamie McGinn scored in the second period for his second consecutive game with a goal. McLellan’s been on his case to pick up the pace and it’s working. Logan Couture played well again also. One thing I notice about him is that he takes the shot — always. It doesn’t matter where he’s at, he will take it. He does it more than Dany Heatley does. Great things are coming from Logan in the playoffs. Ryane Clowe continued his scorching pace with yet another assist. After that forgettable debacle in Dallas, Jason Demers returned to the lineup and added an assist. The planets may be aligning folks — and now that I said that, watch the Sharks lose 8-0 to Vancouver next game. None of the big three registered a point or a +/- rating. That might be alarming to some but not for me right now. What was alarming was the laziness of Patrick Marleau defensively. He may have caught the Jumbo-shrimp syndrome; he coasted around the defensive zone not pressuring anyone. Patty’s played well enough all year that I’ll let the last few games slide so long as it ends in the coming days. A big criticism tonight was the third period. 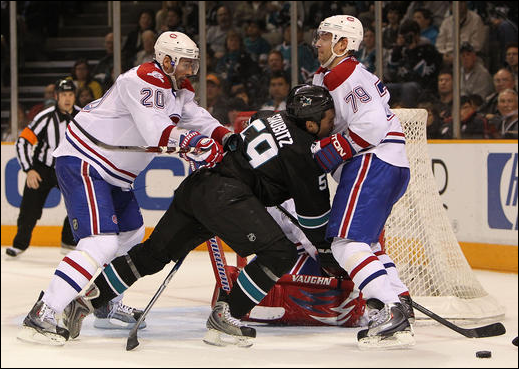 San Jose couldn’t generate any consistent forecheck, which kept Nabby on his toes. 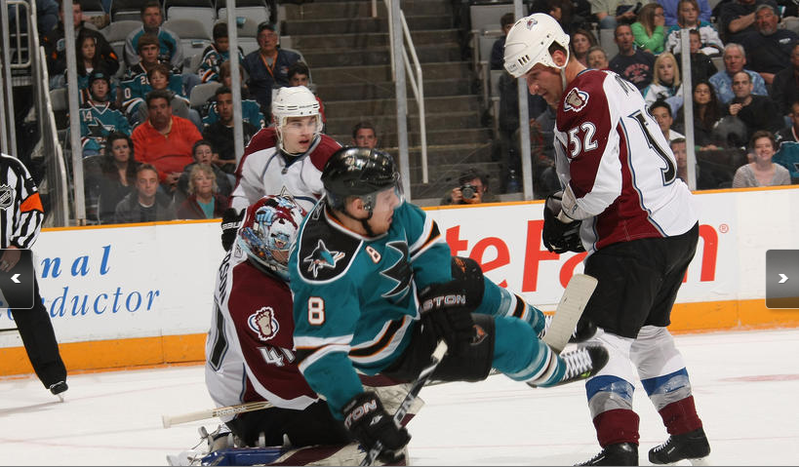 Luckily he obliged, but the Sharks have to learn to push back in situations like those. In the meantime, I’ll rejoice for another Pacific Division title — until next week. Hit-O-Meter: SJ 11 CGY 22; Four players had two. For those wondering, Rob Blake scored the first goal. No suspension for that hit on Mueller, and there should not have been. All away games are done with for the regular season. San Jose returns home for the last two games. Vancouver is in town Thursday. 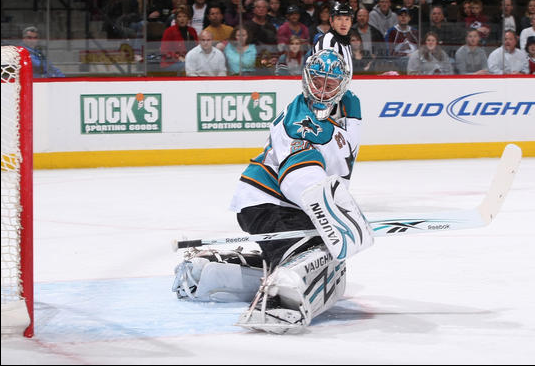 Quite the reversal game for the Sharks as they lost to the Florida Panthers 3-2 in overtime. The gameplay was completely flipped from last game against Nashville. In the last three games, San Jose trailed going into the third, but each time they came back to win. That was an NHL record. Coach Todd McLellan was all but pleased with the effort of the Sharks though. It’s been tough to find a full 60-minute effort this season. The Sharks got the message — for the first 20 minutes — and kept pressure on the Panthers throughout the first frame. Things were looking really good; the Sharks scored two goals and held the Panthers off the scoresheet after one. Florida turned the heat up for the remainder of the game, and with Tomas Vokoun making stops at key times, the Panthers were able to tie the game up in the third at 2-2. It seems the Sharks forgot what it was like to have a lead so late in the game. The Sharks actually attempted to score in overtime, coming as a shock to me. Unfortunately, they weren’t able to find the back of the net. A shot from the point doomed San Jose, and they leave HP Pavilion with one point. It’s like McLellan is a one-period coach. He sure can get the guys ready to play and spark them for one period, but after that, it’s disgusting. That’s not on the coach though. He can turn the key to the ignition, but the players have to step on the gas and keep the pedal down. I’m just glad this string of crappy play is happening now and not at the very end of the season. That occurred last year and we all know what went down in the playoffs. Brad Staubitz finally decided to appear, in his first scrap since Jody Shelley was traded. He took on Nick Tarnasky, and it was an uneventful affair. The two swung each other in circles before falling to the ice. 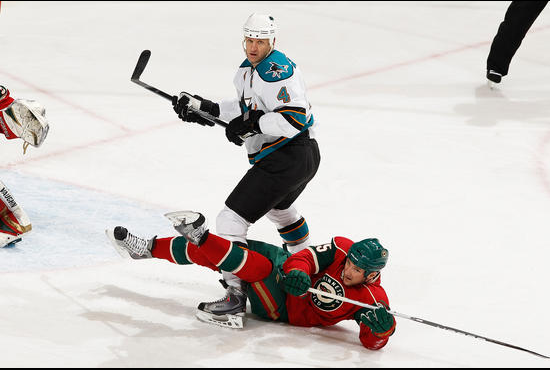 Manny Malhotra took it upon himself to defend Joe Pavelski in the third period. Jason Garrison slammed Pavs’ head into the boards, which sent Malhotra off. The two tussled, but it also was dull. Malhotra received an instigator and 10-minute misconduct for it. Hit-O-Meter: SJ 32 FLA 36; Scott Nichol and Dany Heatley both had six. No photos were posted for the game. Odd. 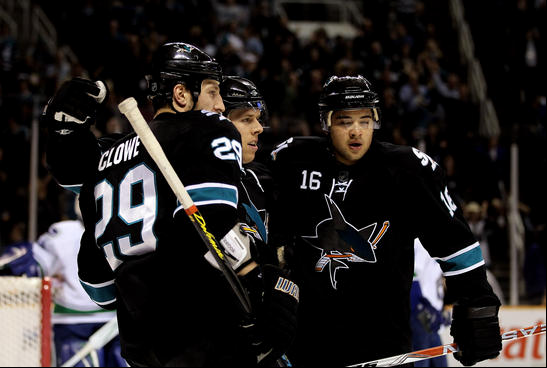 The Sharks travel to Anaheim tomorrow to take on the Ducks.